The life and acts of Bhagavan Krishna is captured and retold from the Mahabharat, the longest Epic Poem in the world. In this incarnation, the Lord is pictured as a playful child, a mischievous tot, and a teenage prankster, yet his divinity and love of mankind always shines through. Krishna Bhagvan expounds many lessons to Hindus via a conversation that he has with Arjuna, this is outlined in the passages of the Bhagavad Gita. Bhagavan Krishna is regarded as the eighth incarnation of Lord Vishnu. He is considered to be the most complete incarnation of Lord Vishnu and is easily recognizable by his Baasuri (flute), and Peacock feather in his hair. He is dark in complexion and was born to Vasudev and Devaki. 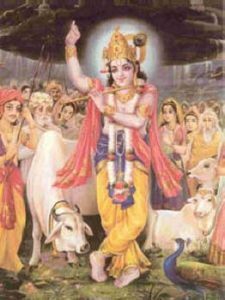 Lord Krishna came upon this earth to restore and establish dharma (righteousness). He has done so by destroying the demon by name of Kansa and has taught us that we cannot escape death. This human life is very short lived. As a result, Bhagavan Krishna teaches us that we must utilize this life of ours to serve God and attain eternal emancipation and liberation. In order to better understand this concept, the divine Lord related the teachings of the Shrimad Bhagavad Gita. In this scripture, we are taught about the laws of Karma (actions), how to attain Bhakti (devotion), and how to acquire Gyaan (knowledge) and Vigyaan (spiritual knowledge). The entire Bhagavad Gita is based on the teachings of Dharma which means righteousness.